The “free gift” is really more of a promotion for Benefit’s “They’re Real” mascaras and liners, which now come in several colors—BUT there’s a code for a free mini mascara or eyeliner when you buy any Benefit Cosmetics product on Birchbox. There was a TON of hype surrounding the Push-Up Eyeliner when it was first released and I too bought into the hype with disappointing results. I don’t know if my eyeliner pen was a dud but I felt like it never drew on smoothly and kind of came out in chunks. I hardly ever used it. No thanks! I don’t really need anything from Benefit at the moment so I probably won’t even use the code. For some reason Birchbox didn’t include their usual card listing the samples included in my box, though the insert directed me to their website to learn more. Maybe they got tired of printing multiple versions of cards for all the various sample permutations they send out? Anyway, let’s take a look at what I got (spoiler alert: I’m pretty excited about all of this month’s samples)! Caudalie Divine Oil : a “dry oil,” which simply means that it’s light and absorbs quickly. 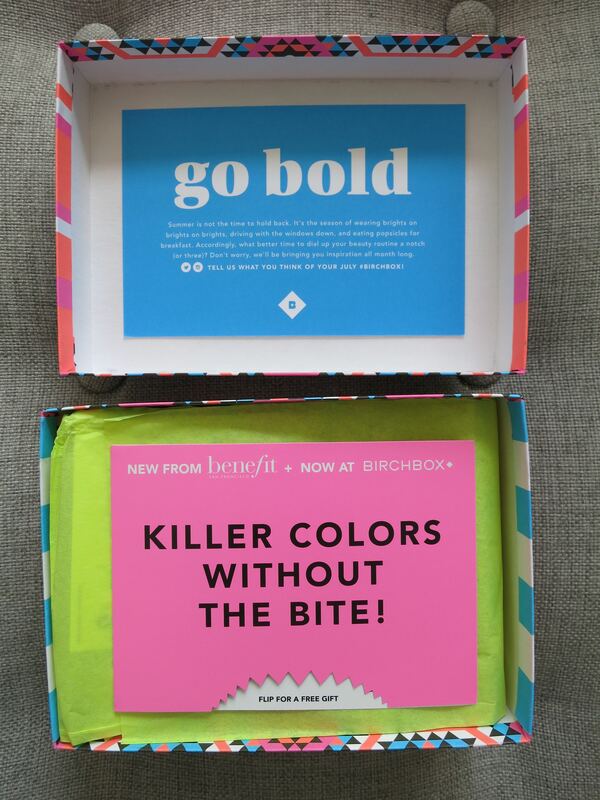 Birchbox’s website description has several typos (oops!) but says that the oil contains grape, hibiscus, sesame, and argan oils and it’s supposed to be great for dry skin, cuticles, and hair. A quick sniff informed me that the oil is scented, so I doubt I’ll use it much in the summer when I know I’m going to be outside because MOSQUITOES. The fragrance reminds me of a perfume I had in high school, and seeing as how the 90s are back I guess that’s a good thing? Stila Look at Me Liquid Lipstick: I was given a choice of red or pink for this sample, and I went with pink (official name: Bella). I’m not a huge bright lip wearer, but I do paint on a colorful lip from time to time. This formula is matte and supposedly stays on for approximately 1,000 years. I’m almost afraid to try it on for this blog post in case I can’t get it off! I’ll post a pic when I do get around to trying it, though (maybe I’ll even wear it tonight—it’s my second wedding anniversary so we’re going out to dinner!). Avène Thermal Spring Water: Yes, it’s water in a spray can. Am I excited about it? Totally! First of all, this is a nice-sized sample. Second of all, it reminds me of way back when I was a kid and my mom would use Evian mineral water facial spray. Third, I’ve really been enjoying misting my face with Onurth’s Rose Hydrolat at night before applying my facial oil, so it’ll be nice to try a mineral water spray as well. A little spritz here and there during the summer can be SO refreshing! It’s also supposed to help sooth irritated skin, so that’s icing on the cake. amika Un.Done Texture Spray: This is the third amika sample I’ve received from Birchbox, and I confess that I still haven’t used the first one I got (the blow-out spray). I’m just not into doing much of anything with my hair, so at best I’ll use a little sea salt spray or dry shampoo. However, a texture spray sounds like it’s exactly what my ridiculously fine hair needs, so I’m definitely looking forward to trying this sample out. Dr. Jart+ Ceramidin Liquid: I’m intrigued. According to the Birchbox website, this product contains ceramides, which are “lipid molecules found naturally in our skin” that help seal in moisture. Apparently our skin produces fewer of these as we age, so this product is supposed to boost our ceramides for better moisture and stronger, smoother skin. Sounds pretty promising, right? Which sample am I most excited about this month? Honestly, it’s hard to say, because they’re all good. If I had to pick one I’d say the texture spray, despite my lackluster attitude toward hair styling. I’ve already found one great styling product for my hair via Birchbox (Parlor by Jeff Chastain Moisturizing Sea Salt Spray) so maybe lightning will actually strike twice? 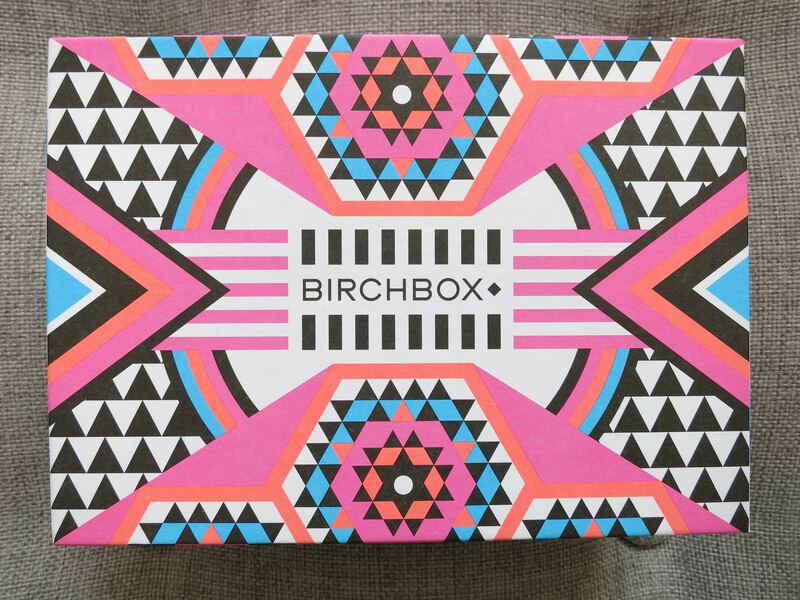 In case you’ve never heard of Birchbox, it’s a $10/month subscription box that includes five sample sized products based on your preferences (makeup, skin care, hair care, fragrance, etc.). 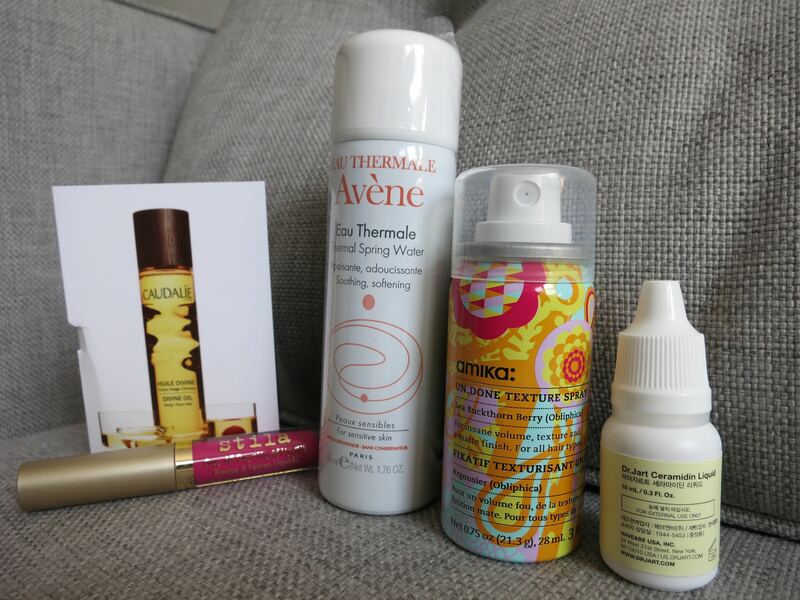 They also have an online store filled with full sized versions of all the products they include in their monthly subscription boxes, so if you fall in love with a sample they sent you, you can go back to their site and buy the real thing. Use my referral link to sign up for your own subscription!